In order to watch too much racing you will need to know when it happens. Keep up with your favourite racing series by adding IWTMR Calendars to your Google Calendar, Apple iCal, Microsoft Outlook, or any other service which supports the ICAL or HTML formats. Just click the link for the series you want to import and it will appear in your calendar. Scroll down to the table below to pick your championships! Scroll beneath the table for latest news and for reasons you should use these calendars! Click the HTML link then click the +GoogleCalendar icon at the bottom right. Simply tap the ICAL link. ICAL is not restricted to Apple devices, try it on others. Try both links and pick the one that works best for your app. Clicking the series short name (left column) will take you to their website. Added: Intercontinental GT Challenge (IGTC). Renamed: Pirelli World Challenge is now Blancpain GT World Challenge Americas. Renamed: IMSA Continental Tire Challenge is now IMSA Michelin Pilot Challenge. Updated: Formula European Masters will now not run. I could reuse this for Euroformula Open if there’s interest. I’ve been updating these since the 2011 racing season. Many decisions have been taken with experience, such as to make the usability the best it can be and to reduce the admin overhead. I will always listen to feedback but that doesn’t always mean I’ll implement it! Pick championships that interest you without getting lots of dates for things you don’t care about. 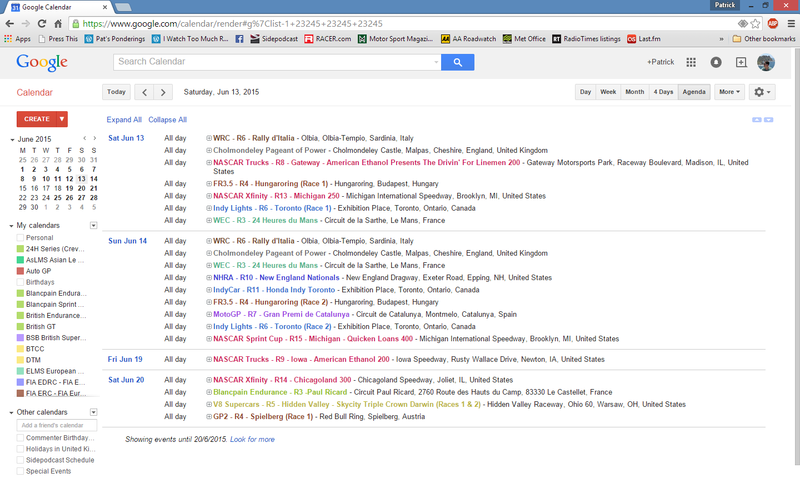 In Google Calendar you can colour-code each championship, e.g. you could make all the endurance series green, single-seater series red, or rally series brown (for dirt..!). Races are why we are all here. Races are most important. Practice sessions clutter the feed meaning you can’t find the races. Clarity is better. When you know the race day you can go to the series website to look up other session times. Use these calendars as a tool to remind you which weekend a race happens. I don’t know where you live! The internet is global. It is up to you to find out what TV, radio and online streaming coverage is available where you are. A short series name, the round number, the event title. This is because I’m aware a lot of people, including me, use these on their mobile phone screensavers and you actually want to be able to read it! Different series number their races in different ways. e.g. one series of 30 races may choose to have 30 individual round numbers (BTCC), another series of 20 races may choose to have 10 rounds and call them ’round 1 race 1′, ’round 1 race 2′, or ’round 1 feature race’ and ’round 1 sprint race’ (FIA F2). I try to mirror the way the championship does it but I’ve probably got this wrong somewhere, so just use this as a guide and consult the championship itself for the correct numbers. Many series have two or three races per weekend. I merge multiple races in a day into a single entry, but if there are different races over 2 days they get one entry per day. A single race over 2 days, like Le Mans, will have one entry lasting 24 hours. All rallies are listed as single events lasting 3 or 4 days. Catch-all. It includes such things as the Dakar Rally, Goodwood Festival of Speed, Isle of Man TT, Nurburgring 24 Hours, Bathurst 12 Hours and anything else that pops into my head. I made this for my own benefit for the 2012 Olympics & Paralympics. I like to know that I’m not going to miss the Tour de France or the FA Cup Final or the Six Nations! Or that racing isn’t going to clash with it. It is heavily biased toward sports I watch and isn’t updated very often. You may share or copy the calendar entries for your own purposes. I would like a credit where possible. Original entries MUST remain unchanged but you can copy them to your own calendar and amend them there. This does not imply that I endorse what you do with it, unless you have asked and got permission. I receive no benefit from doing these, commercial or otherwise. I am not affiliated to any championship or motor racing body or any publication. This service is only a guide. If you miss a race based on an error in the calendars, do not blame me! Yes, this has happened. I do miss things. Dates are changed mid-season without me noticing. Please do tell me! If you find these useful please do comment and most importantly share them. Hi, no problem, I have just uploaded DTM. I haven’t done what used to be called IMSA Conti Challenge – I was waiting for Petit Le Mans to be over so I could change the series name. This’ll be done before the Michelin Encore next week. This page will be updated soon. Individual blog posts for each series will come soon. Any chance you can update the BTCC ical please for 2019?. Hi, I’ve been quite busy lately but will be adding dates again soon. Won’t be long now. That would be great – thank you! Hi Calo, BTCC is now done! I am getting “calendar cannot be added”. Why? Probably because you’re doing it wrong. A courteous request might have been more polite than your curt demand. Hey thanks for doing this again this year. Dude, this is simply amazing! Thanks a lot for all the efforts on this. Thanks again for this Pat – you’re a diamond. Thanks everyone. With the recent break over, more 2019 dates are coming soon. Hi, love these calendars! They’re so damn useful! Do you think you may be uploading WRC this year and if so would it likely be uploaded prior to it starting later this month? Hi Mike. Thanks! To tell you the truth, I was hoping to have done WRC by now. I’m aiming to work roughly in start order ,or by group, so I did WSBK to fit with having done MotoGP. Coming Next: WRC, IGTC (Bathurst 12 Hr Feb 2nd), NHRA, NASCAR, then anything that starts in March. I’m behind target. Current plan is to do a heck of a lot while I’m home watching the Daytona 24. Brad, sorry you’re having problems. I’ve just re-done the ICAL link so give it another try please and let me know. 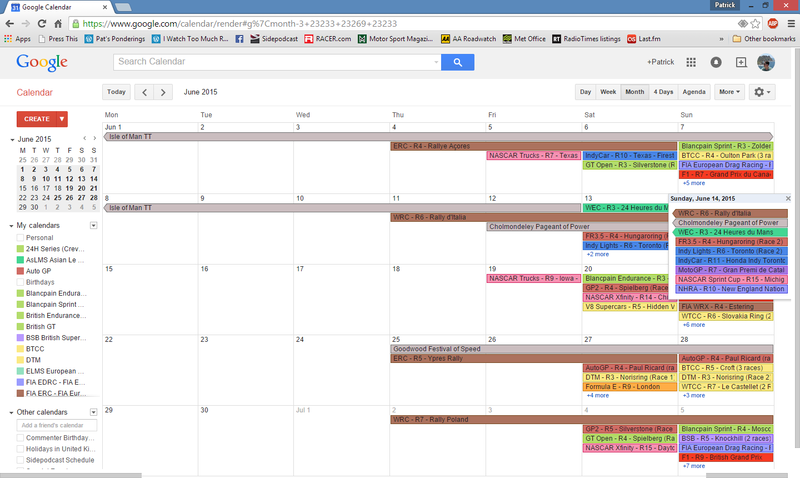 I’ve also added as a new calendar the IGTC including Bathurst 12 Hour, Spa, Laguna Seca, etc. Blog post imminent. IMSA dates were done a while ago and I’m intending to write a blog on that before Daytona starts, it’ll probably publish Thursday. Not sure I’ll have time to write a race preview but shall try. Planning to add more dates during the Daytona 24, depending how busy the race is. It may be a good opportunity to get the 93 NASCAR races done. Loving your work! This is so useful. Do you know when V8SC will be added as this is the only series missing that I follow closely? Sorry – just seen that it has been added and just hasn’t been taken from the to do list…. my bad! and thanks again! Hi Luke, yes the Supercars calendar link is active but there are no dates in it yet! If you are already subscribed, the dates will appear as soon as I do them. Maybe it would be good timing to get those done ready for the Bathurst 12 Hour next week (for promo reasons). Hi Pat, great work with the calendars! Thank you! Do you have an ETA on the VLN races? I’ve kind of given up on any schedule and I’m doing things as I can. Like, I only did Intercontinental GT because it has 5 races! I said I’d do NASCAR this weekend but I’m having second thoughts – it may well make sense to load in as many GT series as I can to tie in with the right audience with it being Daytona24/Bathurst12. Then everything turns to NASCAR after that. NASCAR starts with the Clash on 10th Feb, NHRA starts that sort of time I think, Supercars has high demand and starts early March, MXGP starts early March. All I can say is keep an eye on this comments section over the next 2 weeks. All of the above should be done by Feb 10th. One other follow up question: which calendar will include the Nurburgring 24 hours? Thanks Pat! I usually include it in Miscellaneous. It isn’t part of VLN but there’s an argument for including it there because ‘it fits’. I wanted to do a “Big Sportscar Race” calendar after I finished everything else but it’s a bit late now, we’ve had Dubai and nearly Daytona. Maybe next year. I’ve just done BSB (British Superbikes), which I planned to do straight after WSBK to get the bikes section finished. I’ll go ahead and subscribe to Miscellaneous for now. I have assumed all the Blancpain GT series use the same race format with a race each on Saturday and Sunday, noting the Americas series races are 90 minutes and the other series (sprint) races are 60 minutes. Must say I’m glad they tidied up the mess that was in PWC with Sprint vs SprintX, that was confusing! Americas is also waiting for a TBA to be confirmed in October. Then I’ll tidy up the rest of GT racing: VLN, N24, GT Open, Super GT, ADAC GT, then touring car racing WTCR, TCR Europe. Blog posts will be in the order: Supercars, NASCAR, Blancpain, etc. Blog post to follow in a day or so. I realised drag racing starts this week so I bumped it up the order. Pat – thanks so much for this service, so much easier than going to tvracer.com every 3 days. I understand why it’s too much work to do the start times, and all sessions, so I hope you’ll forgive me for not using yours for my main motorsport, F1. Please let me know if you see errors, I ended up doing all 3 series in one session last night and I was getting pretty tired. I think it looks right.